Elsewhere, in a land ruled by the priests since a terrible war depleted all but a little magic, Rielle the dyer’s daughter has been taught that to use magic is to steal from the Angels. Yet she knows from her ability to sense the stain it leaves behind that she has a talent for it, and that there are people willing to teach her how to use it, should she ever need to risk the Angels’ wrath. My word is that a long blurb! So long that I imagine that anybody still reading by this point probably skipped a lot of it. And I could have gone off to find a shorter one or written my own (even though I couldn’t have done that because I read this on holiday in May…) but then I decided that it actually nicely illustrates my main gripe with Thief’s Magic so it gets to stay. There’s too much blurb and too much everything. Too many characters, too many ideas, too much overview. Mostly at the expense of depth and detail. First up is Tyen. While out on an archaelogical dig, he uncovers a book that has to answer the questions that its readers address to it and that can absorb information while in contact with someone. Chased away by locals, he flees with his party back to their city, where magic-fuelled technology is the order of the day. New modes of transport, new types of printing press, mechanised robot-like creations and the like. It all felt quite like steampunk to me but with a magical twist that was kind of quirky and fun to read. Tyen is a decent character too but I don’t have a whole lot to say about his friends because they were a bit lost in the already mentioned ‘too much everything’. Rather than solid secondary characters in this thread, we have world-building. Despite some questionable decision-making by Tyen (it always annoys me when people who go on about how lucky they are to be doing something abandon it all so readily) and the fact that it was quite YA in tone and in the way that relationships developed, it had action on its side so it was pretty readable and I was always glad to get back to it. While Tyen’s running around with the book that can talk (sort of), being chased by the many glory hunters that want to steal it for the knowledge it contains, Rielle’s story is bumbling along, set in a completely different, Middle Eastern feeling, patriarchal society where using magic is theft. The thing is, it’s never clear whether she’s living in a the same world as Tyen but in a different time, the same world but just a different country that is less advanced and feels like it’s in a different time, a different world at the same time…you get my point. After 553 pages, I still have no real idea about how these two storylines relate to each other. I don’t mind two plots running alongside each other at all but these kind of feel like two different books just smushed together with little more binding them together than…well, the page binding. I know that there is almost certainly a plan and an overarching plot that Tyen and Rielle’s stories will be part of but I just can’t see what that might be yet and, if I’m being brutally honest, I don’t care. I don’t feel like I’ve connected with either of the characters and I’m non-plussed about the plights of their respective countries/worlds/times/whatever. That wasn’t helped by the fact that Rielle is a bit annoying anyway. She’s kind of selfish and immature and her decision-making skills are even worse than Tyen’s. The main problem is that, because each character’s story gets roughly half of the novel’s attention, there’s only have about 200 pages or so to set up each one, weave in some secondary characters and relationships, set up the political, theological and sociological position of the country/world/time/I don’t know what that they’re living in and get their story moving a bit. Even with the best and tightest writing in the world, there’s no way that’s going to work in a well-rounded way. If there are so many ideas to be squeezed into the series, it either needs to be longer or you have to be ruthless. It feels a bit like a smudging together of all of the ideas that Canavan had for stories. It isn’t as bad as I’m making it sound – I still think it’s a 3 star book but it’s quite hasty and obvious in its delivery to pack everything in. I really didn’t hate it. It was fine. 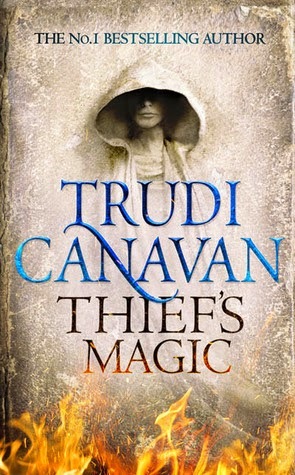 What I think makes me so disgruntled is that Canavan’s Black Magician trilogy is one of my favourite fantasy series so I was really excited to get to read Thief’s Magic ahead of the release date. I started it as soon as I could and, although the start was promising, I ended up feeling like I was trying to enjoy it rather than just enjoying it. Thief’s Magic just wasn’t the book that I was so convinced it would be. Overall: A bit of a let down. There are some good points and I enjoyed at least half of it but I’m not sure whether I want to carry on. If the later books are as long as this one, I’ll probably wait a little while to see what the reviews are like and whether it looks as though things will start to come together. I never thought I’d say about a Canavan series and I hate writing that but it’s true. Sorry. Source: Received from the publisher in exchange for an honest review via NetGalley – thanks, Orbit! Let's Read-along Dickens and Tolstoy!